As in most of this region, Martinique's first settlers were Arawaks from South America. However, their population was devastated by an eruption of Mount Pelee in 295 AD and then by the arrival of the warlike Caribs in 600 AD. Contact with Europe began in 1502, when Christopher Columbus landed on the island during his fourth voyage under the Spanish flag. However, he concluded that the island was too hostile because of its fierce population and because of the presence of snakes. Therefore, Spain took no interest in the island. French settlers driven off St. Kitts by the British arrived in Martinique in 1635 and claimed the island for France. The newcomers were not welcomed by the Caribs and violence commenced but by 1660, the remaining Caribs were defeated and exiled. Many of the early French settlers were Huguenots. Indeed, during the 1600s, France deported a thousand of its protestant subjects to Martinique as indentured servants. However, by the end of the century most of Huguenots had escaped to the British colonies in the Caribbean or America. This exodus of the Hugenots, diminished the number of workers who farmed the sugarcane and other plantations that had been established on Martinique. However, in the 1680s, King Louis XIV established regulations for the importation of enslaved Africans to work the plantations. Slavery on Martinique was first abolished in Martinique as a result of the French Revolution. In 1794, the revolutionaries abolished slavery. However, just as this happened, Martinique came under control of the British who supported the French Old Regime. As a result, the slaves were returned to their masters. Under the Treaty of Amiens, Martinique was returned to France in 1802. However. slavery was re-instituted by Napoleon, according to local lore, at the suggestion of the Empress Josephine, who had been born on Martinique. The British re-captured Martinique in 1809 and held it almost constantly until after the final defeat of Napoleon. By then the British had ended the importation of slaves in their own empire and required France to agree to such a ban in exchange for the return of Martinique. However, it was not enforced. Slavery was finally abolished in all French colonies in 1848, largely due to the work of abolitionist Victor Schoelcher who went on to represent Martinique in the French Assembly. Above: Martinique's most famous historical figure is probably Josephine de Beauharnais, first wife of Napoleon Bonaparte and Empress of France. Her family lived on Martinique in the 18th century and she is said to have been born on the island. (St. Lucia claims her as well). 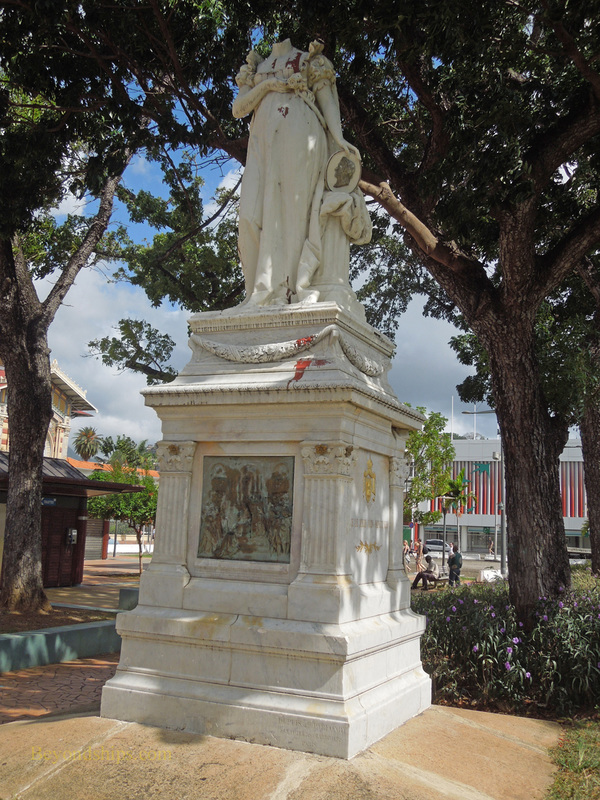 The Empress' statue in Fort de France was decapitated in 1990 because of her alleged support for the re-introduction of slavery into Martinique. Throughout its history Martinique has suffered from natural disasters including hurricanes, earthquakes and volcanic eruptions. The most famous of these happened in 1902 when Mount Pelee erupted wiping out Martinique's then-capital city St. Pierre. (See separate article). During World War II, Martinique came under Vichy control after the German occupation of metropolitan France. However, to forestall an Allied invasion, the authorities agreed to immobilize the elements of the French fleet that were stationed in Martinique. In 1943, Free French supporters gained control and the naval vessels and gold stored in Martinique became assets of the Allied cause. Following the war, France enacted legislation making its former colonies overseas department of the French Republic rather than independent nations. The idea was to make these new departments the same as departments in mainland France. Martinique deputy Aime Cesaire was one of the principal drafters of this legislation and Martinique became an overseas department of France in 1946. In 1974, the overseas label was dropped and Martinique became a department of France.